The Mescalero Apache are predominantly located in south central New Mexico, generally south of Ruidosa and west of Tularosa. For more info, visit the Mescalero Apache Reservation website. The Mescalero Apache are one among five Apache people groups in the United States. They are federally recognized as the Mescalero Apache Tribe of the Mescalero Apache Reservation in south central New Mexico. The Mescalero people operate several tourist enterprises to attract people and boost their economy. Mescalero identity is filled with legends of the past. For instance, four mountains represent the direction of everyday life for the Mescalero Apache people: those being, (1) Sierra Blanca, (2) Guadalupe Mountains, (3) Three Sisters Mountain and (4) Oscura Mountain Peak. Moreover, their forefathers spoke of a creator giving them life on White Mountain. It was there that White Painted Woman gave birth to two sons, Child of Water and Killer of Enemies. They were born during a turbulent rainstorm when thunder and lightning came from the sky. Their identity is also reinforced by maintaining rituals and rites. For instance, one rite of passage is a four-day ceremony that marks the transition of an individual from one stage of life to another, from girlhood to womanhood. In their belief system, specific animals serve as either good or evil fortune. Snakes, bears, and owls are all considered omens and are to be avoided. To learn more about the Mescalero people, click here. Pray for Mescalero Christians to have boldness in sharing their faith in Jesus Christ. 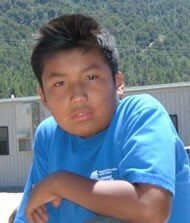 Ask God to work in the lives of younger Mescalero to understand and receive the message of Christ. Pray for Christians to minister to the Mescalero felt and spiritual needs.